I'm always on the lookout for cheap no fuss eats in our neighborhood. A few months ago while we were riding our bikes down Hyperion to Trader Joe's, we noticed a tiny white storefront. We stopped to read the menu plastered on the glass door. Finally a bahn mi place nearby! 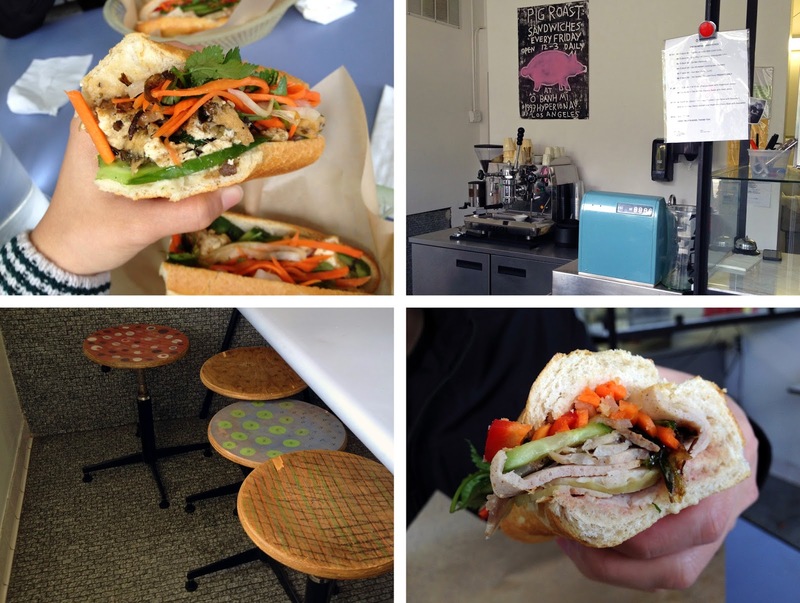 Could O Bahn Mi be the Lee's Sandwiches of Silver Lake? But our excitement quickly turned into wariness because hipster Asian food can be hit or miss, and usually it's the latter. For example hipster Pho Cafe cannot even compete with the bomb Pho 87 in Chinatown. And I just said the bomb. We did not eat there that day because it was closed. So fast forward to a few weeks ago. Antony and I are arguing about what we should eat. Should we eat before or after Trader Joe's errands? Blah blah blah oh wait there's that O Bahn Mi place on the way to Traders how convenient! So we went and ordered their regular cold cut and veggie sandwiches. The french bread was crunchy and fresh and the pickled carrot toppings were on point. Antony said the meats in his sandwich were good, not amazing. I liked my tofu lemongrass sandwich because it was warm and quite flavorful. The prices are around $7-$8 which I would consider cheap in the Silver Lake area, plus the nearest Lee's is in the San Gabriel Valley. Final verdict is it's not a must try, but it's definitely an easy and satiable place to go when you are brain dead and don't want to eat fast food. Although they do have this pig roast sandwich thing only on Fridays that really got Antony excited to go back. 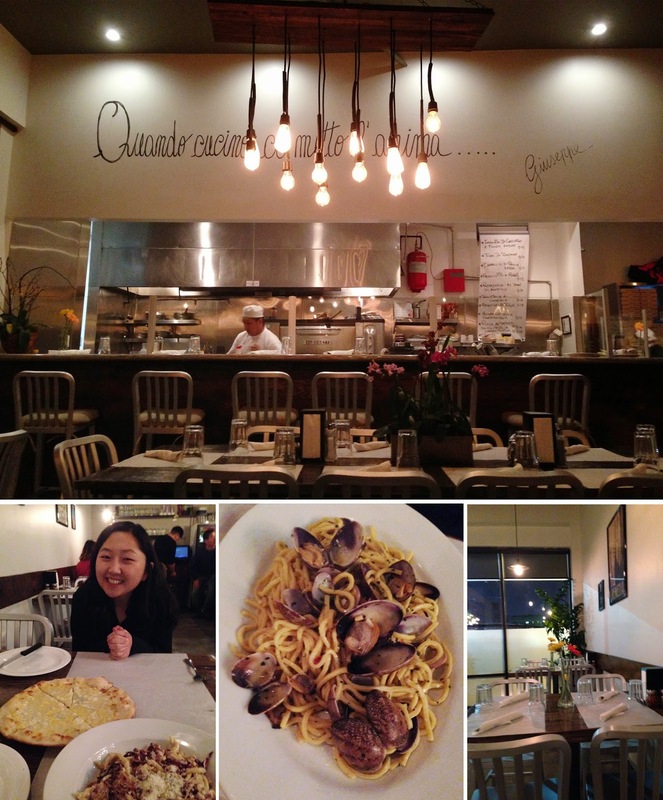 Koreatown may not be the first area of town you go for good pasta, but I recently tried a yummy, affordable pasta spot right in the heart of Koreatown. Anima Pizza and Pasta opened just a couple months ago next to one of my favorite restaurants, Kobawoo House. Anima is not like Caffe Concerto, which features Koreanized pasta -- which is delicious in its own way. This is real Italian pasta! From what I can gather from the rave reviews on Yelp, this is a real Italian restaurant with a real Italian chef. The menu is huge, and I had a difficult time choosing what to eat. Our waiter read us their ridiculously long list of specials, but I finally decided on Strozzapreti alla Trentina because I had never tried strozzapreti before. It turns out that their other strozzapreti dish (with saffron) is one of their most popular. Sharon (my human Yelp) recommended we try Anima, and she ordered the Linguine alle Vongole. We also ordered the 4 cheese white pizza, which was VERY cheesy in the best way possible. The food was all good - I have 0 complaints! The wait staff was very attentive, and the restaurant is clean and decorated cutely. With really reasonable prices ($8-12ish for real pasta!) and just 1 block from the Metro, I know I will be back! I'm already planning to bring my parents there. Also, if you're not already sold, the waiter mentioned that the pasta is handmade daily! Another cute place to look into- That spot where Caffe Village used to be is now something I can't possibly spell out in English, but is called 코루보쿠루 or something in Korean. It has a very similar menu to Caffe Village, but is like, way nicer and cuter inside. WAY. And they serve iced drinks in mason jars. WHO DOESN'T LOVE DRINKING OUT OF A MASON JAR?? ?